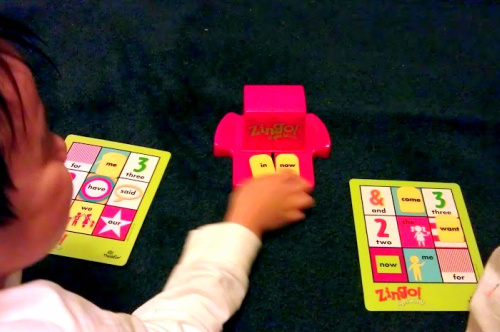 Toys As Tools Educational Toy Reviews: Review & Giveaway: Zingo! Sight Words: Learning is Easy When It's Fun! 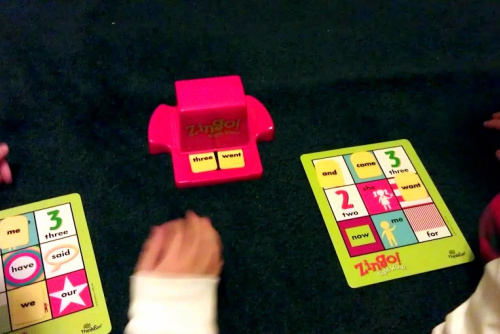 Review & Giveaway: Zingo! Sight Words: Learning is Easy When It's Fun! Do you remember how you learned to read? I kind of do because I was six years old around the time that I started to learn English. And how did I learn how to read words? Television! Of course! Public television to be more precise and no it really wasn't from the ever famous Big Bird. Actually, I learned how to read from the Electric Company. I loved the way they blended words together SN - UG "SNUG" (See here for example and select Silhouette Blend). Kids can not resist the Zinger! I can't help but think of the old credit card swiping machines. If you don't know what I mean, please do not tell me. I will just crumble. But some words don't have any logic to them. Those always made me mad but I have memorized them. To my dismay, my kids have not. I now know that they are called sight words. Said is sed not sade. Who is hoo and not wa hoe. 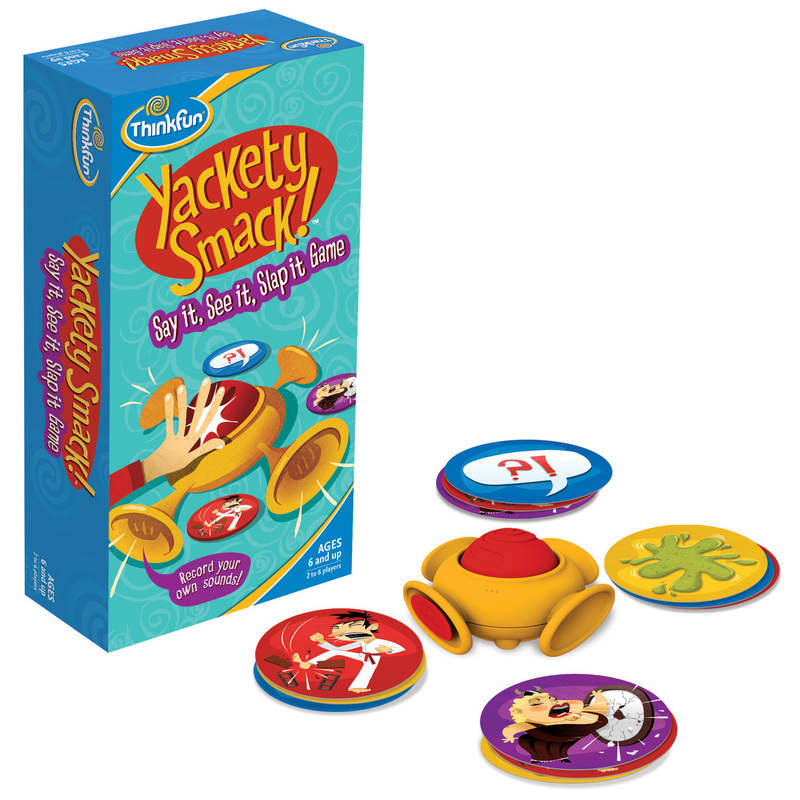 Now that I understand what sight words are, I feel good that I get to play Zingo! Sight Words with Number 2 Son who is learning how to read now and he's pretty good at it. 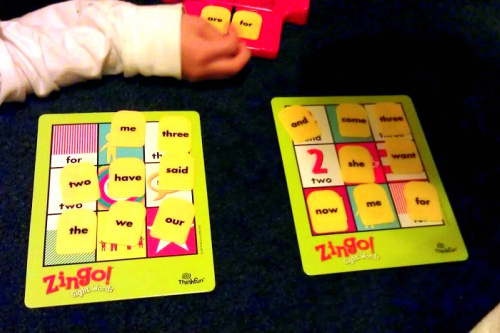 However, since sight words have little logic to them and this new Zingo game is good news indeed! That is, because I can fairly say with confidence having studied more than three other languages, English is a really is a tough language to learn. If kids or immigrants have a hard time learning to read English, it's not their fault. Blame Brittania. We have owned and played Zingo! and Zingo!123 possibly hundreds of times (no kidding, Number 2 is crazy about Zingo) but for Zingo! Sight Words, I decided to consult an expert because I honestly don't know how kids are taught sight words. This is Number 2 who loves anything Zingo! If he had a dog, he'd name it Zingo. 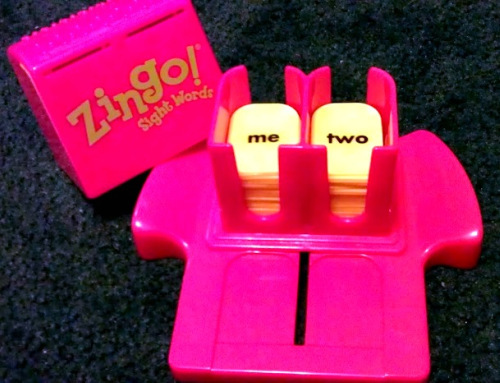 If I had another child, he'd asked me to name him or her Zingo. Can you see the numeral three on the left board? 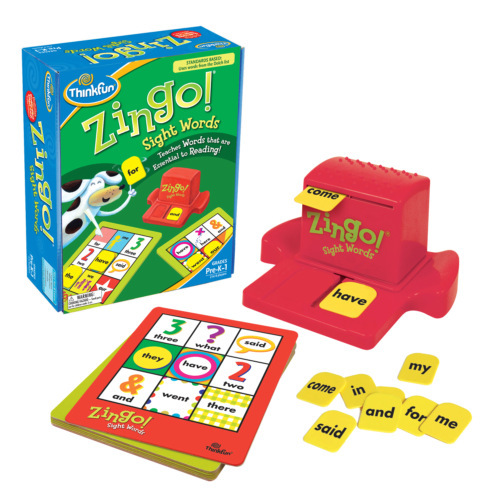 "Oh, I love Zingo," said Alison Berkley, one of my favorite education experts who is a true toy lover. She owns many bingo games and but to Alison, Zingo! Sight Words really stands out. 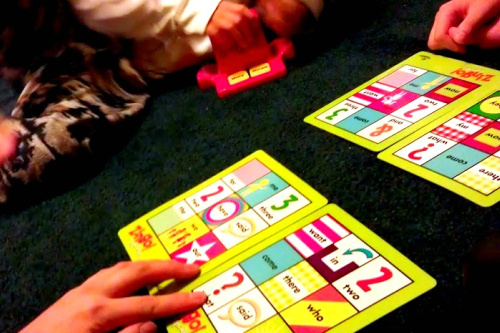 "It’s a great game for kids because they like the tile things, [they] like clicking it back and forth! It's really cool," she said. "They like shoving the tiles back and forth when they’re done. 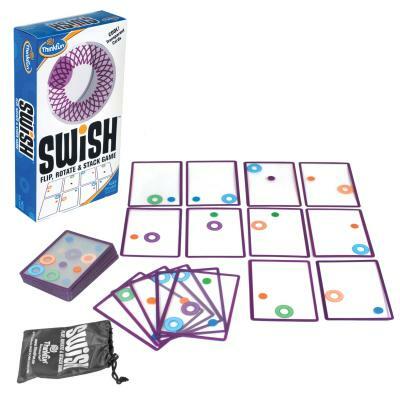 The boards are really colorful and engaging." See how fast this kid's hand is? He Zingo-cizes regularly. He started playing Zingo when he was two. Of course the little guy won. I am sure big brother went slightly slower for him but that's okay. Alison said that we use images to teach vocabulary. "You hold up a cup and you say cup. When you’re teaching new words, that’s always kind of what we do," Alison explained. "You’re teaching them the meaning of that word and if it’s concrete, like a number, you can show it." Then Alison showed me what the clear difference was from Zingo! 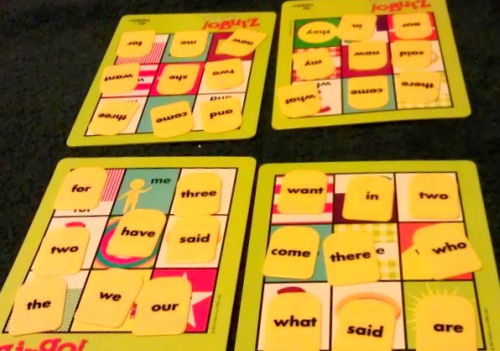 Sight Words and other Bingo Vocab games. "The other Bingos that I have have big pictures and tiny little letters on the tile boards as well as the tiles. So there... they're just matching pictures," she said. But for Zingo! Sight Words, it's different. 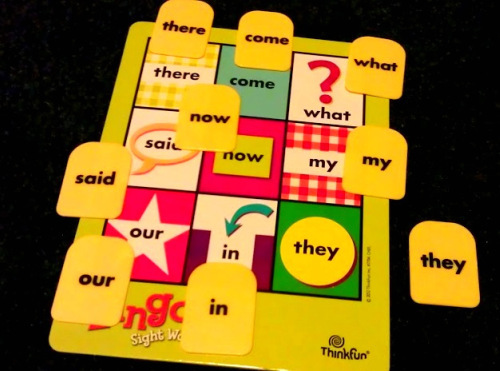 "You are asking them to read the word on the tile and then look at their board, so they are reading first and then matching second." You can see that the words on the tiles and on the board is the same size. It's a subtle but very helpful detail. Finding New Ways to Learn? My Number 1 Son! That kid is always doing kooky things. He made me play this double board game with him. We finished our challenge round and we didn't run out of tiles! 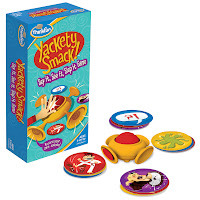 Speaking of fun, this game is really a blast, especially for the little ones. However, it can be more fun for the ones who might have a winner-loser anxiety IF you take turns and not let it be competitive. (One person uses the Zinger at a time, if you have the word and matching tile, keep it, if not, give it out or push it back into the Zinger.) Alternatively, you can be like Number 1 Son and make it much harder. Just use more cards per game! You can play against a little one if you use two cards and he uses just one. Use post it notes to cover up some words if you only want to use half a card. There are lots of tiles in the Zinger so one adult and one kid can play this way without the adult falling asleep on the child because they purposely went slower to give the child a bit of a chance. Thanks to Charlotte Fixler at ThinkFun's SmartPlay Blog for allowing me to reprint this picture. Like I said, when you really just need to take a deep breath and just play... Here are folks playing Zingo! 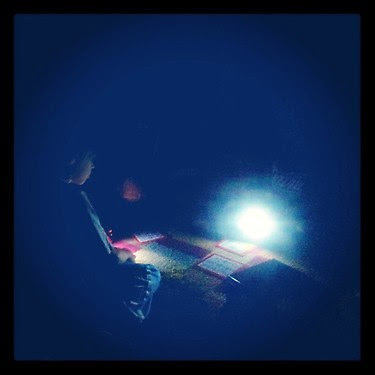 during their blackout due to Sandy. I hope they have the power back on. Lastly, as those of us in New York and New Jersey and other affected areas deal with the aftermath of Hurricane Sandy, I think back to those first days where many of us suffered from what might be called Cabin Fever. To be honest, I don't know if it was Cabin Fever that my family suffered. Looking out of the window was frightening and we weren't exactly "bored." Each time we turned on the T.V., (because we were lucky that we never lost power) the news grew worse and worse. And I have to say that while this family had SO MANY GAMES here (can't hide this fact), the best games for us at the time had to be the ones that made you laugh. We really needed to laugh. 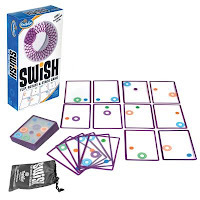 This game helped us entertain each other. Sure this is a tool to increase sight word recognition and it is really good at that but you can't underestimate the fun factor. It's just as strong here and that is Zingo's gift. Speaking of gifts..... Can you say FREE DONATION? What? 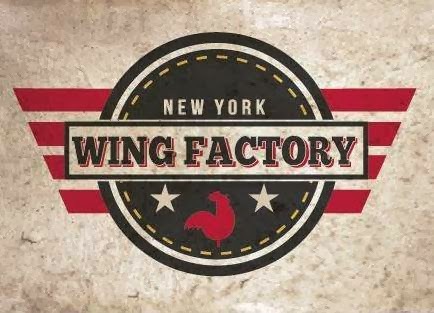 ThinkFun, in partnership with the Toy Bank of the Toy Industry Foundation wants to make sure that a new game gets into as many hands of children whose lives were affected by Hurricane Sandy. 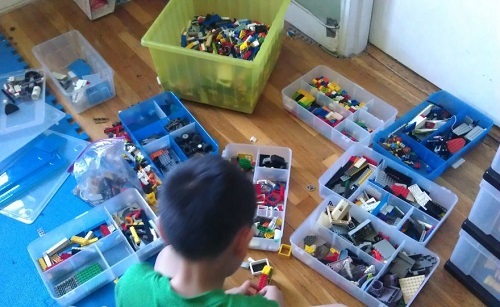 Can you imagine your children losing all of their beloved toys? ThinkFun makes giving really easy here! Now all you have to do is buy a game from their website (not other vendors, see how my Amazon link is NOT here). 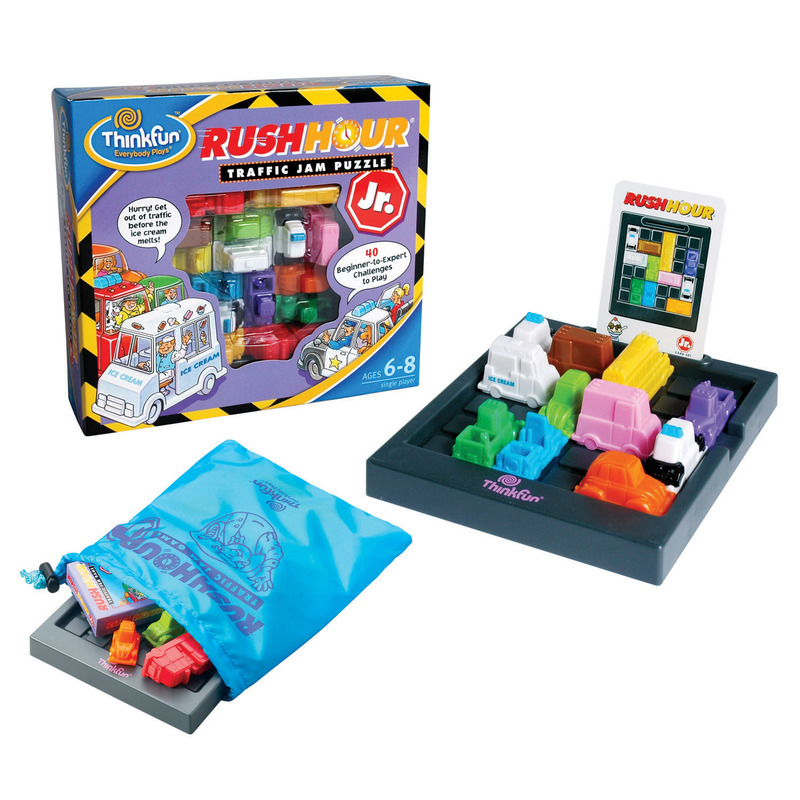 When you do, you'll get your own own game but THINKFUN WILL SEND A NEW GAME TO A FAMILY AFFECTED BY SANDY (buy one- give one!) but this special promotion-donation is only until Midnight 11/9/12. Is that what you might call a "free donation?" Guess what? There is even a 25% off sale right now too!!!! So please join me. If you were here in this part of the country, you'd know that we are talking about few other things than figuring how to help when we barely have ANY GAS to drive to affected areas to drop off donations or just go and help. We know people who have lost homes or are still living in the dark. There are tragedies abound and if you are feeling grateful, bless you, and may I say that there is no better way to compliment the feeling of gratitude than by giving back yourself. Don't know what to buy? You are at the right website! Here are my reviews for ThinkFun games. I love more than what's here but these two hands can only type so much. 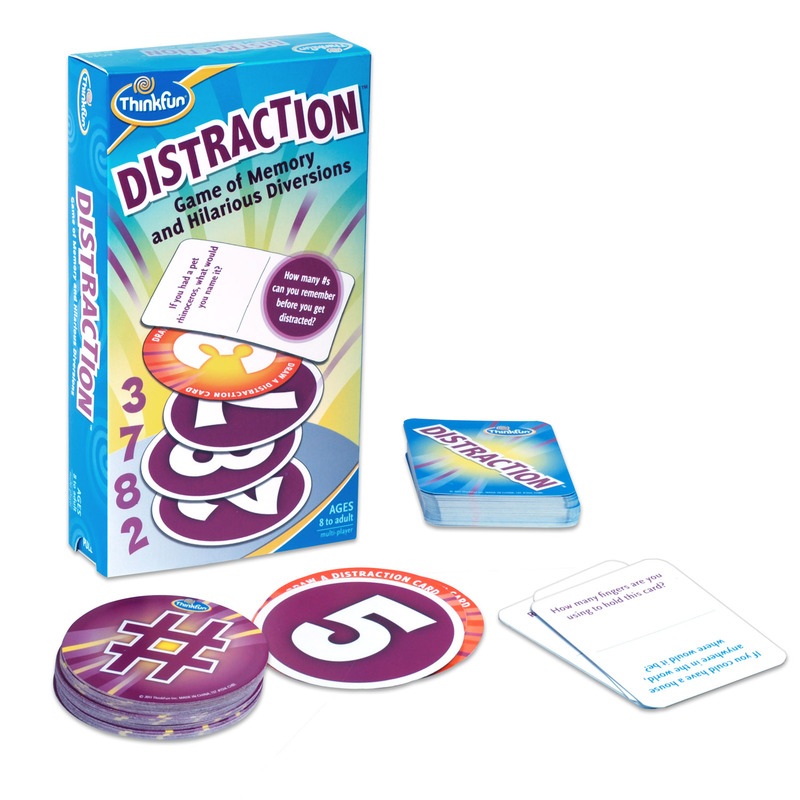 Distraction - give your working memory a workout that works! Cartoon It! 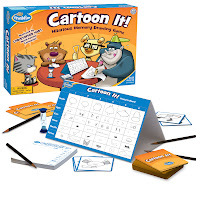 - Excellent drawing-memory game. Very unique! Makes a beautiful gift! and one more that I wrote for another website. Roll and Play- toddlers' first game! Emergency toddler birthday party gift. You can't go wrong. 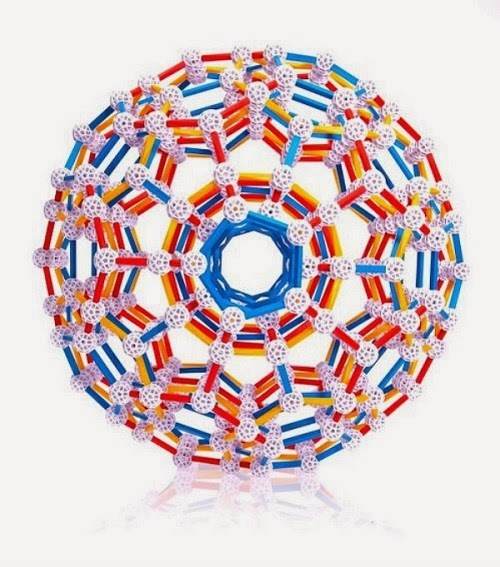 Disclosure: Toys are Tools has not been compensated in any way by the manufacturer of this product. 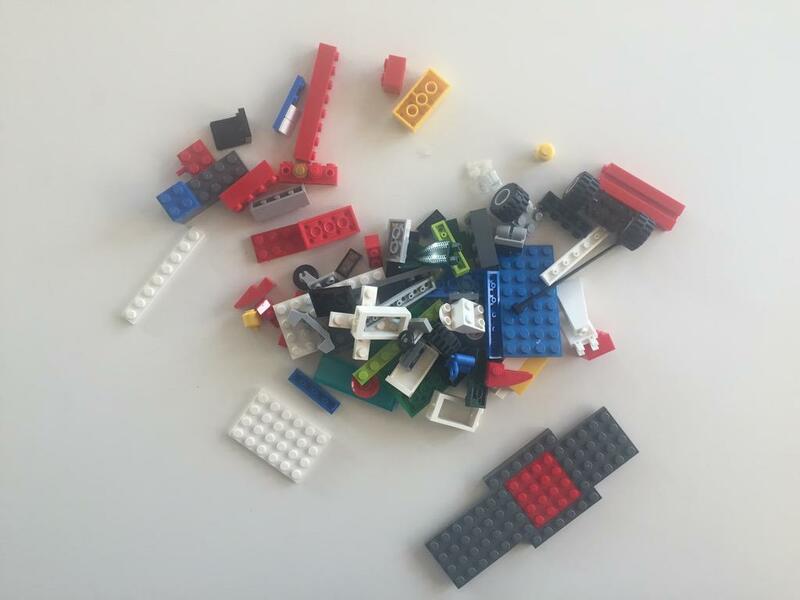 The product was submitted to tester and expert to facilitate a review. Reviews are never promised. The giveaway prize is being donated by the manufacturer. This post is dedicated to my friend Melanie who has been carting donations back and forth as soon as she came back to a home with heat and electricity! Where do you get your gas, lady????? Your son will learn from your example. It's the best way to teach compassion. 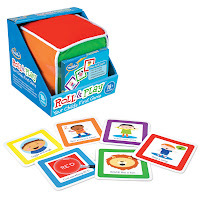 Since my oldest is not yet two, our favorite ThinkFun game is the Roll and Play! It looks perfect for my youngest.